Since I have hens who lay eggs, I was curious to discover what exactly constituted “rare eggs.” The news video showed a small, remote Mexican village and an astonished rural housewife who couldn’t understand why her hen laid green colored eggs. To the majority of my 3.5 readers, this probably does seem a bit astonishing. But any chicken enthusiast, farmer or 4-H member knows that a certain breed of hen (Americauna or Araucauna) has a tendency to lay green or blue eggs. In fact, I have some green eggs sitting out in my coop this very minute. The photo below shows my eggs. However, I’m afraid that my amateur photography and inexpensive camera do not do the green shade of the eggs justice. You’ll have to take my word for it. Picture the underside of a leaf – a light green hue. Just like these eggs. I value accuracy and proper reporting; consequently, this story almost gave me a panic attack. This ridiculous news reporter and her cohorts obviously did no research. If they weren’t stupers (short for incomparably stupid persons), they were doing a pretty darn good imitation. Just a few strokes of the keys and a Google search would have revealed that green eggs are no rarity. I can’t help but wonder how often research-free reporting takes place in larger, more consequential stories. My sister-in-law, Hortense, is a complete stuper. You see, we have boys the same age. Whatever activity her son, Herman, participates in, she insists mine do the same. Herman loves soccer. Hortense says that if I don’t enroll my child in soccer, I’ll be making a huge mistake. I keep telling her, we tried it and didn’t like it, but Hortense just shakes her head at me like I’m crazy. She does this with everything. She discovered religion three years ago and now her family goes to church every Sunday. We don’t. I’m constantly reminded that we’ll be going to Hell. She makes me feel like I’m a bad mom and a bad person. I’m so upset! Stupidity can be annoyingly meddlesome. At the risk of causing offense, I believe some stupers have a knack of making going to hell sound like a pleasure trip. Mainly because they won’t be there. Hortense may have discovered Jesus a few years ago, but it appears she misplaces Him at her convenience. Tolerance is not part of stupidity’s itinerary. I’m sorry to hear of your stuper troubles. I have a relevant question for you: What would you do if you’d just lay down to rest and from nowhere (as stupers are wont to do) appears a rough, itchy, heavy blanket that lands right atop your resting body? Would you continue to lie there or fling off the worthless burden, leap out of bed, and possibly, if so motivated, tear said blanket to bits? Of course, this can be done in a more placid manner as well, meaning you may calmly get up and remove the ponderous blankie, then return to your repose and more important matters. If I may borrow a few words from a speech by Churchill, there’s no room for the “…weakling, for the shirker, or the sluggard” when it comes to stupidity. I feel certain Hortense empties the contents of her meager mind because you appear to be easy prey. I suggest you use your words, and as few as possible, to tell Hortense to buzz off. You are at an advantage since you seem to know what to expect from her. If you don’t feel like speaking to her, nod your head and smile (smile is optional) when she offers her so-called advice. She’ll get bored and stop. If you give her a reaction, she’ll continue, as stupidity loves attention. I’ve found most stupers really do talk too much. They are clueless about the power of their words. Even thinkers who take advantage of the telephone, the internet and other modern everyday luxuries, usually take the words they utter for granted. Why not take advantage of our words? Stupers don’t use them well which is all the more reason why the rest of us should. There is a great power behind words. They shape our circumstances – and our lives. Watch your words. And watch out for Stupers giving advice. I’ve always had a soft spot in my vocabulary for the word “excellent.” Perhaps because it’s everything stupidity is not. Which brings to mind all the excellent and intelligent blogs I’m going to pass this award on to: Julianne at AnotherGrayHair, Agnes at HexMyEx, Mary at Motherwise, Wendy at My Musings, Dan at MyDen, Starlily at The Active Life, Flowers on a Friday, Mikster at Reality is Overrated and Maribeth at Moments and Memories. These are just a few of the blogs I regularly read and enjoy. Thank you, New Diva, for this wonderful award, and thank you to all who read my blog. I very much appreciate your taking the time to pay me a visit. Stupidity not only wastes time, energy and brain cells, it squanders earth’s resources as well. To wit: paper. I carefully examined said paperwork for a clue as to the reason behind the unprovoked elongation. A full three and one-half inches was devoted to my actual transaction. The rest read like a one way conversation with a store mannequin, if mannequins could talk, and if they were bilingual in English and Spanish. “We value your feedback,” took almost four inches; “Satisfaction guaranteed,” took another four inches. 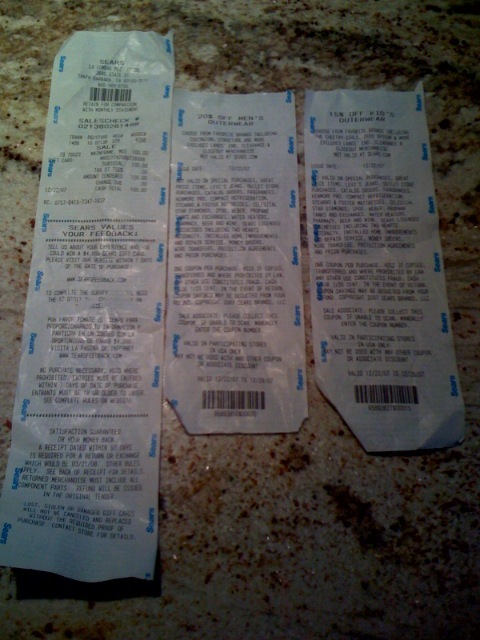 The second two pages were coupons that took more than two feet to list all the items for which the discounts could not be used. We hope you are happy with your purchase. If you’re not, please save your receipt and return or exchange the item within 90 days. If you are inclined to and over the age of 18, please give us your feedback at www.searsfeedback.com. Also, to reward you for shopping at Sears, you may use this letter as a 15% coupon on kids’ clothes and a 20% coupon on adults’ clothes. Many, many, many items are excluded from these coupons, but you are welcome to attempt to find something that is not. You have until 1/31/08 to make these purchases. Thank you ever so much. The above note could have been printed on a six-inch long receipt. It easily could include the letter plus the transaction information. The paperwork Sears provided me alone, could have been used on six customers. Stupidity is not efficient or effective. There is little one can do with idiocy of this ilk other than to write a letter to the executive office and hope it rings a little bell that awakens an otherwise dormant mind. There’s nothing wrong with doing favors for another person. Unless the one for whom the favor is done is a stuper (short yet again for an imprudently stupid person). When my kids were moppets, I spent a good portion of the day carting them to and from preschool. I had no qualms about giving their friends rides, having buddies over to play or bringing energetic little lads with us on outings. My problem lay with the parent who dropped her kid off at my home at noon, promised to return in two hours and wasn’t seen or heard from again ’til Late Night with Letterman, without so much as a call. One incident in particular stands out. 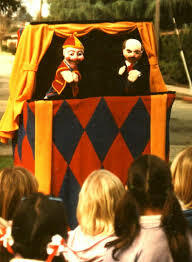 Not because it took place at a very fancy puppet show on the very green lawn of a very historical spot where children were not usually allowed to frolic, but because I waited a very long time for the parent in question, stay-at-home-mom, Molly, to show up. 1. Why does a stay-at-home, non-working parent need a nanny to watch her four-year-old? 3. Was Mikey’s dutiful nanny actually working even when her charge wasn’t around? As you may have guessed, the puppet show came and went, sunglasses were put away, the clean-up crew picked up every last crumb remaining on the premises, and the gardener gave us beastly looks. He scowled and mumbled a steady stream of noxious profanities that were thankfully in a foreign tongue, then sharpened his weed whackers with fervent zeal. Who could blame the madman? We lingered wantonly on the near perfect lawn. Meanwhile, I gazed searchingly out into the horizon for a trace of Molly. I’d been unsuccessful in my attempts to contact her. I pictured myself sitting there beneath the moon, my two tots and Mikey sprawled on the impeccable lawn, covered in dewdrops and grass clippings that the livid gardener had refused to clean-up in protest. As we gathered ourselves to go to the car, guess who finally decided to make her entrance? “Thanks so much, Keli! You really are a sweetie! It couldn’t be helped! I had to stop and visit the ladies at the Charity League,” she breathlessly explained. I am happy to report I have since lost track of Molly. “Yes” was omitted from my vocabulary when it came to requests from her, post puppet show incident; hence, I forfeited all usefulness to Molly and was rapidly deleted from her blackberry. Molly was oblivious to her offense, as stupers typically are. For her, it was a way of life. If I believed talking to her would have made a difference, I’d have done so. But based on her past behavior, I felt otherwise. There’s nothing wrong and everything right with offering to help another person. But if you desire to maintain your sanity, it’s important to make it clear up front just how much help you’re willing to give. Time-consuming requests can be draining, not to mention irritating, especially when originated by a stuper. An indisputable character trait of a stuper (short yet again for a jarringly stupid person) is the inability to listen when others are speaking. Listening means not interrupting, not performing a little jig mid conversation (unless requested to do so by the other party) and not abruptly changing the topic at hand to one more palatable to the stuper. Listening to another person entails nodding periodically, inserting comments or questions at appropriate intervals and making eye contact, all of which lie outside the restricted mind and cramped capabilities of stupers. My friend, Stan, periodically meets his banker buddy, Bruce, for coffee. Bruce woefully lacks presentable listening skills. Stan pays attention and tries to be genuinely interested when Bruce talks; however, Bruce does not reciprocate. When Stan speaks, Bruce listens for about eight seconds, before shifting his gaze and his trifling mental cargo to others at neighboring tables, often with such intensity that Stan turns around to locate the subject of Bruce’s rapt attention. He usually finds Bruce engrossed in such exciting events as an elderly woman pouring sugar into her tea or a man reading a paper while devouring a donut. Mind boggling events from a stuper’s standpoint. My fair-minded readers may be thinking that perhaps Stan’s topics of conversation are humdrum forcing poor Bruce to seek diversion elsewhere. Au contraire. Stan is a dynamic, energetic and engaging speaker. The real problem lies in the stuper’s ridiculous conviction that the sun rises because of him/her. Anything others have to say is uninteresting, unimportant and uninspiring unless, as I’ve mentioned earlier on, gossip, malice or scandal is involved. Or unless, the topic is about the stuper him/herself. I had dinner at the home of my older son’s friend recently. I spent most of the evening listening to Myrtle, the mother of the friend. I heard how she bought, remodeled and furnished their home. Myrtle poured out details about everything from nasty neighbors who called her to inform her that the color of their newly painted home was putrid, to how Myrtle practically stole precious antiques from a hapless dealer. The conversation was not of my choosing, but I did my best to be a courteous listener. The next time my son visited his friend’s house, Myrtle mentioned to him that she found me charming and intelligent. I had barely spoken a word. But I had listened. Mostly out of a sense of obligation, as she was the hostess. That’s what made me so appealing. I didn’t even have to utter a scholarly word so long as I appeared a good listener and allowed Myrtle to speak at immeasurable lengths about herself. I was a stuper’s dream. In order to distinguish yourself from the stupers among us, make sure you train yourself to at least have a semblance of listening skills. If you find your thoughts wandering, fear not; try bringing your attention back. Focus on one-three important points in your companion’s tale or argument. This helps you to be an active listener according to media coach and CEO of Clarity Media Group, Bill McGowan. If you truly are driven to madness from the tedium of a conversation and unable to escape, as I was with Myrtle, you have permission to allow your mind to wander. But please try not to be a conspicuous non-listener, like Bruce. Do pop in now and then with an “Oh, really!” or a “How nice!” After all, there are times when listening to another speak is truly gratifying. Since stupers are mostly unable to listen properly, they never experience the sense of engagement that comes from a worthwhile conversation. I’m willing to bet that the majority of my 3.5 readers knows what a doorstop is. For any who may not, a good guess will do. I have several doorstops in my home preventing bedroom doors from creating a ruckus every time a breeze blows through an open window. Now, how many of you know what a door stuper (short for a noticeably stupid person) is? Consider this: a stuper is walking. He/she decides to enter a busy department store. But instead of entering, the meager mind stops in the very center of the entrance door, and commences to pitch his tent, lodging himself in such a way that no one else may enter or exit, blocking any hope of passage. There is a reason why tables, chairs, and magazine stands are not typically located in thresholds. Alas, stupers have yet to grasp this fine point. This type of standoff also occurs on sidewalks where two or more human impediments stop, side by side, to chitchat, oblivious to the existence of others. They too neither come or go. They just halt, making others around them do the same. Cows sometimes pause on the road, refusing to budge for passing cars. Hence the need for cow grids. Do we need stuper grids? The same thing happens at entries to buses or subways where the intellectually impoverished hover in the doorway so no one else can pass. Is it a power trip of some sort? No. It’s unawareness. I’m afraid I’ve stopped and blocked on the sidewalk to catchup with a friend, but it only takes a moment to realize I’m getting in the way of others before I move. Stupers don’t stir. They could possibly remain where they’re standing for the rest of their lives. There a few ways to manage such stationary stupidity. Try saying, “excuse me” in a voice meant to yell “fire!” in a baseball stadium. If the stuper(s) remains immobile, take a few steps back, get off to a flying start if necessary, and push past. If there is no room to get by, try purchasing a bull horn ($23.95) to get their attention. Of course, this will get everyone else’s attention too. Finally, in emergency situations, you may want to invest in a mini or petite stun gun ($69.95), that’s the size of a pack of cigarettes. It’s easy to carry and packs up to “900,000 volts of debilitating, unyielding power.” Batteries are not included, but a charming little holster is. Say you’re driving along the open highway at or around the speed limit of fifty-five miles per hour. There’s a single lane for each direction buffered by broad, flat shoulders reminiscent of the jolly green giant. They are so broad that one could park one’s car, set up picnic tables and host a barbecue with plenty of room to spare for a marching band. Why then would a minivan stop in its tracks, on said highway, blocking all motorists behind it? What’s that you say? Because the engine broke down? Close, but you don’t get the prize. The correct answer is that something did break down all right; but not the engine. It was the dilapidated, non-functional mind of a stuper (once more, short for a taxingly stupid person). This scenario was activated by the appearance of a small canine. A Chihuahua, to be exact. Not on the highway. Not on the spacecraft size shoulder. But off to the side of the ample shoulder. This pooch wasn’t even facing the road, but was trotting off in the opposite direction toward a trailer park. My sixteen-year-old sat behind the wheel of our car with me riding in the passenger seat. Naturally, I shift to red alert when with my teen driver, all radars up and running. I even have my own make-believe brake beneath my right foot while my left hand clutches the dash. The minivan abruptly halted in front of us. Yes, the shoulder was free for the taking, and the oblivious dog was a good fifty feet away. Remember that stupidity does not perceive a situation the same way we do. My son and I saw a dog that may have needed some assistance. After all, it was off the leash and near a highway. We would have pulled over to the shoulder, safely. And then taken the animal in our protective custody before attempting to find the irresponsible owner. The stuper saw no shoulder or approaching traffic behind her. She viewed, off to the side, a lone, albeit happily trotting critter and decided rescue was in order. Other motorists be damned! What was more important – potentially saving a small creature who might or might not turn toward the highway or leaving your vehicle in a spot where the possibility of being hit ranks right up there with the possibility that Cleopatra ruled Egypt in 51 BC? The stuper parked her van on the highway. My son passed her on the left when safe to do so in an open turn lane and resumed driving home. Another option would have been to honk. Really lay on that horn till the stuper took notice. But our priority lay in moving out of the path of danger. When I find a moth fluttering in my home or a wandering pill bug, I take a small notecard, gently place the creature atop and move it outdoors. So please do not think for a moment that I do not value life forms. That is, non-threatening or thinking forms. But stupers are neither. Those who place animal life above the safety of humans, in effect, devalue human life. Does saving the life of a Chihuahua justify placing human life in jeopardy? Who would you throw off the lifeboat if you had to choose in order to stay afloat, the chihuahua or the counterfeit human? We’ll save that discussion for another time. The simple fact was, the meager minded driver could have safely and readily pulled over to the amply sized shoulder, and then pursued her heroic notions. As it was, she placed other drivers in harm’s way. Should you find yourself in a similar situation, safely remove yourself from the scene. And then, and only then, if you can be of assistance, please do so. I’ll come right out and say it – I’m depressed. Not a deep, droopy, dull-eyed, “what’s to become of me” despondency, but the more shallow sort, lurking on the surface. This is what happens when I shift into slacker mode and stop writing. I do write fairly consistently. In fact, my next article appears in the March issue of…oh, it’s not important. Just some magazine story about the communicative capabilities of my dogs. But what’s sent me into this dip is that I’ve yet to publish my book. It’s almost complete. The manuscript sits in my full view daily; I’m not blind (only severely near-sighted), yet I choose to ignore it. What does that make me? That’s right, a stuper (short again for a markedly stupid person). All I have to do is take the pages, clean them up, give them a scrub, and polish them till they glitter. But I don’t. Could I have indolenza? You know, that uncongenial affliction that combines laziness and indolence, meaning my teacup is full, and I lack the drive to look for more (excuse me, while I give my fingers a rest from typing). It’s no fun to stand still. It’s even less fun to brand oneself a stuper, particularly when one considers oneself to be a stupidity specialist. I believe I excel in successfully overcoming encounters with stupid people. But what happens when the stupid person is myself? I’ve always suspected that many experts have trouble following their own advice. Is not one’s greatest enemy oneself (or at least one’s thoughts)? Does Dr. Wayne Dyer ever want to beat the hell out of anyone? I think so. I can read between the lines. Don’t get me wrong – I’m a big fan of Dr. Dyer’s, but I think we fall off the wagon sometimes, and it’s not always easy to chase the rickety thing down and leap back inside, especially while it’s moving. What’s preventing me from completing my book, you might ask? Well, there is the windowsill in the kitchen that hasn’t been dusted all week. And I haven’t written a thank you note to Geico for the insurance information they send me each and every month. But ultimately, I think it’s some sort of a fear. A ridiculous, ludicrous, nonsensical fear of what will I do once it’s done? Or what if I do a half-cocked job? Or what if I fail? Or (insert your own convenient “what if”)? When I find I’m hiding beneath my stupidity soapbox, instead of standing atop it expounding my theories and helpful management tips, I know I need help. I try to find another writer or expert and discuss what ails me. Last night I found my aunt, the dentist, who is not only a writer herself and has her third book on dentistry coming out any minute, but who exudes motivation and gives a natural boost to all in her presence. I suggest that if you find yourself acting like a stuper, grab someone whom you are certain is not one and tell him/her how you feel. Talking it over with an authentic person may give you the direction you need and the motivation to do what you should. Driving, for most of us, means staying in the lane of our choice and leaving it with proper notice ( I casually refer here to those with Turn Signal Deficit Disorder). We do not drift out of the chosen lane with wild abandon, unless there’s an emergency. Or, unless you’re a stuper (short for an unerringly stupid person). 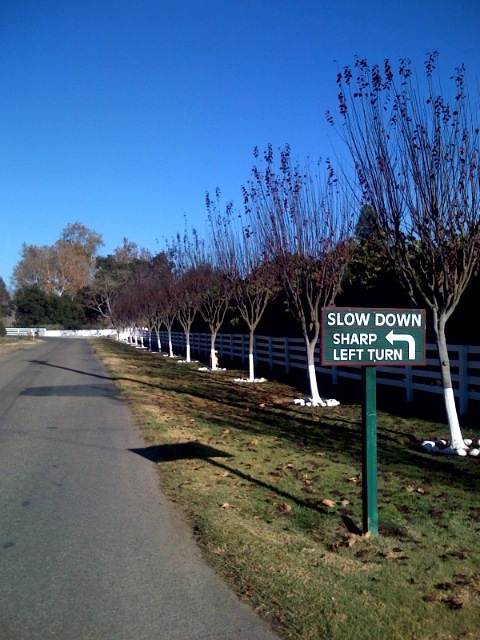 For stupers attempting to navigate roadways, staying in the chosen lane is optional; drifting is perfectly acceptable and adds variety to an otherwise tedious task. And please take note: when the mind is perpetually adrift, how can focused concentration on driving possibly take place? Alas, this can be exceptionally unpleasant and even hazardous if the stuper strays into a bike lane, jogging path or strip of grass reserved for those seeking serenity and quietude in the form of an afternoon stroll. If I’m not mistaken, you, dear readers, see asphalt, representing a roadway, for use by motorized vehicles and bicycles. You notice the shadows, the brilliant blue sky. And you see grass, which is reserved for wildlife, vegetation and walkers/joggers who wish to stay out of the way of motorists. The grass may be viewed as a sanctuary of sorts. Stupers do not see asphalt and grass. Forget the sign. They only see one thing: a wide roadway. I stick to the road/grass border when I’m out for a stroll. And I go in the direction opposite the traffic so I may see oncoming cars, as I tend to err on the cautious side. Should an automobile approach, I quickly shift onto the grass. Unfortunately, this does not guarantee my safety. A few days ago, a large car chugged along toward me; I made an abrupt sidestep. But so did the carefree motorist who veered off course like a drunken sea captain feebly trying to grasp the slippery ship’s wheel while being thrashed about during a severe storm. I dove into the space between the decorative plum trees and the white fence. Meanwhile, the stuper drove as closely to the tree row as possible, before finally returning to the road. After I got up, brushed the grass and leaves out of my hair and spit the dirt out of my mouth, I attempted to assess the situation. I could have been squashed! What if I’d been a trusting, absent-minded pedestrian? I underscore and highlight the importance of staying alert. Remember, stupers suffer from a hindering lack of awareness. Their minds wander…perpetually. Should you find your mind meandering when awareness is required, gently coax it back. Or stupidity might catch you…unawares. Think first, last and always! You are currently browsing the Counterfeit Humans blog archives for January, 2008.